The trailer has the characteristics of several different trailers. The universal trailer can be used as a transport trailer of an ordinary tractor, chaser bin, or as an organic fertilizer spreader. In addition, the universal trailer has other advantages over conventional trailers. A moving tailgate keeps the trailer stable and stops it from tipping over during unloading. 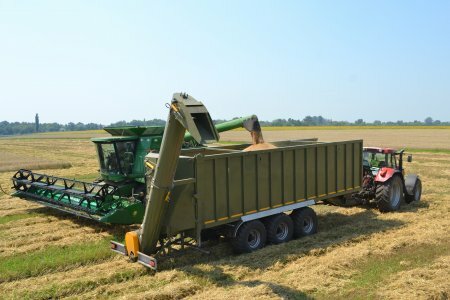 Compression allows 30-50% more of silage to be carried by these trailers than by ordinary trailers, and 32-45 m3 load can be unloaded in a room that is only 4.4 m high. Replacing the tailgate with a spreading device quickly turns the trailer into an organic fertilizer spreader. The spreading mechanism is driven by the tractor's PTO shaft - 540 rpm. The fertilizer spreader is equipped with an overvoltage protection device and the width of the area being spread is more than 18 meters. In addition, it is possible to attach a Ø520 mm grain conveyor with a capacity of 6 tons per minute to the trailer. 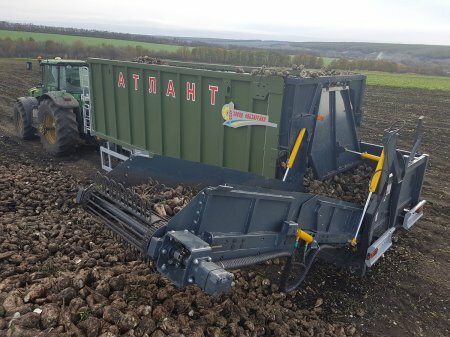 The model AZP-46 is a semi-trailer trailer, which can also be connected to a tractor using an accessory.